I’d like to share a few things about the Altar in a Byzantine church, since many may not be familiar with its setup. It is much more complex than a simple table but, as you have come to expect from the East, richly symbolic as well. There are variations in usages, but there are a number of standard elements. The picture here is of the Altar in our monastery church, so I’ll work with that. First of all, to be technically correct, in the Byzantine tradition, what is called the “Altar” is what would be called the “Sanctuary” in the West, and what is called the Altar in the West is called the Holy Table in our tradition. That does do a bit of violence to the plain meaning of the term “Altar” in English, which denotes a thing and not a place or area. So for the sake of convenience I will use “Altar” and “Holy Table” interchangeably to mean that upon which the Holy Sacrifice is offered. The Holy Table itself is traditionally cubic in structure, modeled on the heavenly Jerusalem: “its length and breadth and height are equal” (Rev. 21:16). In some churches (especially larger ones) this may be rather impractical, but for our little church a 3 x 3 x 3 foot Altar is just right. Also from the Book of Revelation comes the seven-branched candelabrum, reminiscent of the seven golden lampstands in the midst of which the Son of Man appeared (Rev. 1:12-13). Before that, God had commanded that in the original Tent of Meeting there should be a golden lampstand. “And you shall make seven lamps for it…” (Exodus 25:37). Behind the Altar is, of course, a large crucifix, the significance of which is self-evident. On either side of it, however, is something not self-evident. Oftentimes we’ve been asked by people of the Latin tradition: “but why do you have two monstrances on the Altar?” The fact is we have none. Those are ceremonial fans called ripidia or hexapteryga (Greek for “six-winged”). On them are little icons of the six-winged Seraphim. They recall both the cherubic images placed around the original Ark of the Covenant (see Exodus 25) and the constant presence of the Seraphim at the throne of God in Heaven. Front and center on the Holy Table is the Book of the Gospels (to the right of it is a hand-cross for blessing). The Gospel Book rests upon the antimension, which is unfolded during the Liturgy. Upon this the sacred vessels are placed when the gifts are brought to be consecrated. 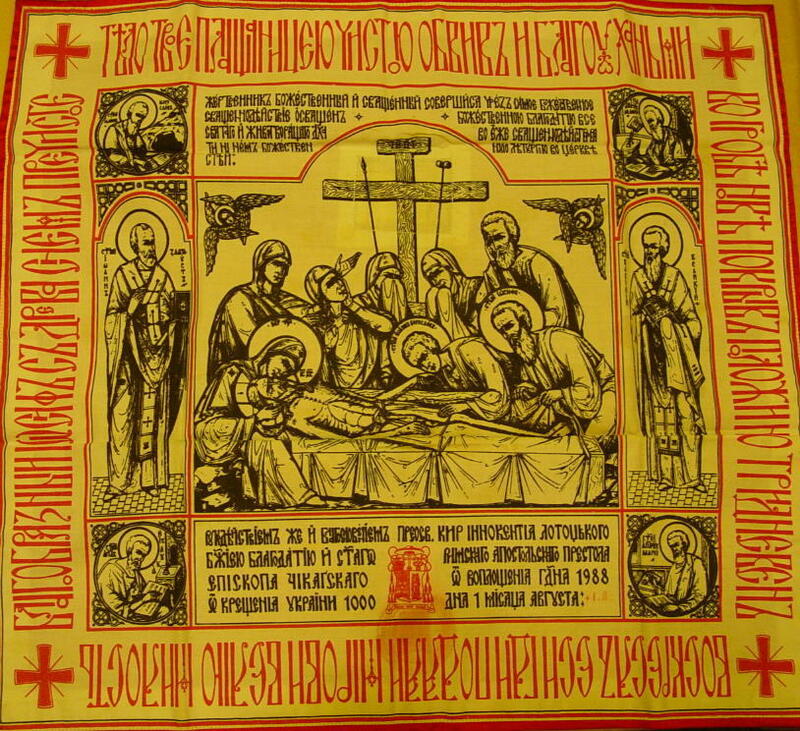 It usually has an icon of the burial of Christ in the center of it, and often has icons of the four evangelists and of SS. John Chrysostom and Basil the Great (authors of the two major sacrificial liturgies in the Byzantine Church), as well as inscriptions of liturgical texts. Relics are sewn into the antimension, and relics are contained within the Holy Table as well. On our Altar (though I know of no liturgical prescription about this) we also keep the Holy Chrism and a relic of the True Cross, since these are among the holiest treasures of the Church. 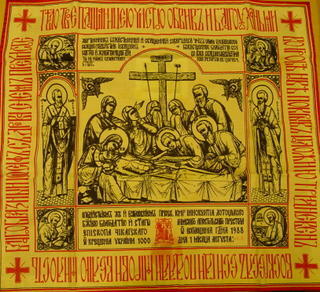 Our Altar covering is bordered with traditional Ukrainian embroidery. Ordinarily you will find a tabernacle on the Holy Table. (I prefer “tabernacle” to the Greek artophorion, simply because it is more meaningful. Artophorion literally means “bread-bearer,” while tabernacle means “dwelling place.” One means a holder for something, while the other means a place where some One resides—though of course the faith is the same in both traditions.) Usually the tabernacle is made in the form of a little church, but occasionally you will find (as you do in our monastery) a tabernacle in the form of a dove suspended over the Altar. This works from a practical standpoint by keeping clear the already limited space on the Holy Table, but more important is its symbolism. It reminds us that it is the Holy Spirit through whom the gift of the Holy Eucharist is given to us; by the power of the Spirit the miracle occurs. “…send down Your Holy Spirit upon us and upon the Gifts here present. And make this bread the precious Body of Your Christ. Amen. And that which is in this chalice the precious Blood of Your Christ. Amen. Changing them by Your Holy Spirit. Amen, amen, amen!” (from the epiclesis). The icon in the apse is called Our Lady of the Sign (the sign being the prophecy of the Incarnation in Isaiah 7:14). She is an image of the Church, especially of the Church celebrating the Divine Liturgy: arms outstretched in prayer, bringing forth Christ from within her. The image in the apse varies from place to place. Often it is the patron saint or mystery of the church. To the right (not visible in the picture) is a vesting table, and to the left (also not visible) is the proskomedy (or prothesis) table, upon which the liturgy of the preparation of the gifts to be consecrated is performed. 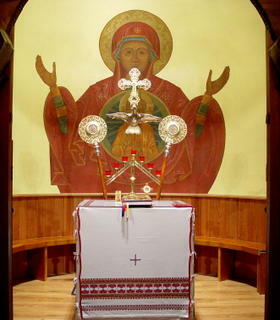 All in all, the setup of the Altar is meant to express the mystery of the sacrificial death of Christ, the proclamation of the Gospel, the continuity with (and hence fulfillment of) the Old Testament, and the ongoing participation in the heavenly and eternal liturgy described in the Book of Revelation.